WOW! Waterfront home with so much! After significant interior renovations this 2 Bedroom, 2 Bathroom, split plan portrays like 2 Master suites. Spacious living room, remodeled kitchen has granite counters, breakfast bar, buffet service area, plenty of cabinets, and tray ceiling. Dining room has triple pocket slider to the pool, sitting area with built in and Murphy Bed for the over flow guests. Large private master bedroom has walk in closet, slider to the covered/screened lanai, and ensuite bathroom. Pocket door off the kitchen creates a private suite to Bedroom 2 with the guest bath, and sliding door out to the pool and deck. Swimming pool and spa have solar heat and spacious paver deck. Separate patio area just off the pool for grilling leads you to the back yard and large paver patio area by the dock. Concrete seawall, Stationary and floating dock are Trex material, 10,000 pound boat lift. 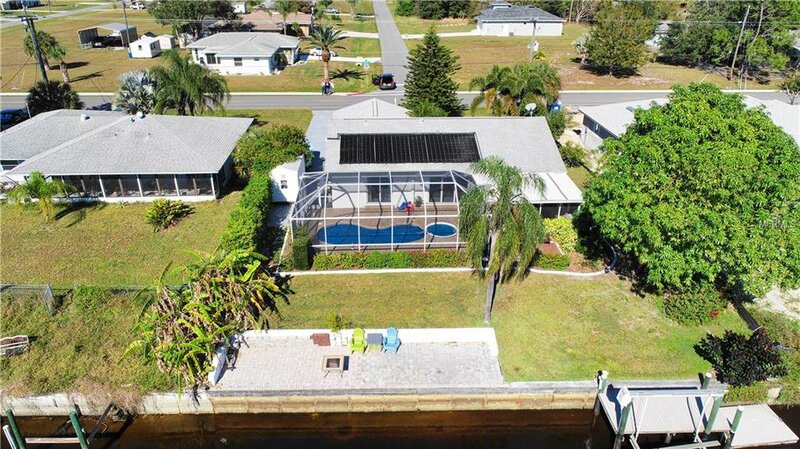 EXTRAS: Home has foam insulated barrier roof, Impact Resistant hurricane windows and E film tinted all around - no need for shutters, 6x14 storage shed, RV/Boat parking, irrigation on timer, fruit trees, and landscape curbing. Approximately 1,600 feet to the Peace River via water and the same distance to the Harbour Heights Park and newly renovated public boat ramp and day docks, playground, lighted tennis courts, and more. Golf, schools, medical, churches, and shopping are all nearby. Just a short distance to I-75 at exit 167 affords easy access to Fort Myers/Naples to the south and Venice/Sarasota to the north. Listing courtesy of COLDWELL BANKER RESIDENTIAL RE. Selling Office: GULF SHORES REALTY.